Effective January 1, 2015, workplaces under federal OSHA jurisdiction will be required to report all serious work-related injuries within 24 hours of their occurrence. These include in-patient hospitalizations, amputations or losses of an eye; fatalities will require that OSHA be notified within eight hours. Read Revised OSHA Rule Requires Employers to Report All Serious Injuries within 24 Hours (September 2014, EHS Today) to learn more about the change, and its intended impact on employers, workers and injury rates. 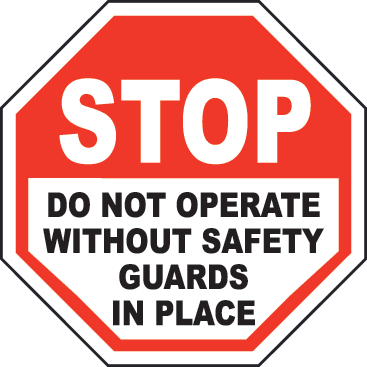 Safety is the number one responsibility of every manufacturer – and it’s a particularly challenging and important task in operations where personnel work with potentially hazardous machinery. That said, the best safety device is one that offers maximum safety with minimum impact on machine operations at the lowest possible cost. Read How to Select the Right Safety System for Manufacturing Applications (October 2014, Manufacturing Business Technology) for practical tips to select the most appropriate safety devices for typical manufacturing applications. For help in selecting the right safety system for your application or to order Omron STI safety products, call Innovative-IDM at 877.906.2100 or send us an email at info@iidm.com. We know successful machine builders have to deliver next-generation machines that are increasingly flexible, reliable and productive over the complete machine lifecycle. That’s why Omron Automation and Safety offers next-generation automation and safety solutions that help OEMs build simpler and superior performing machines. 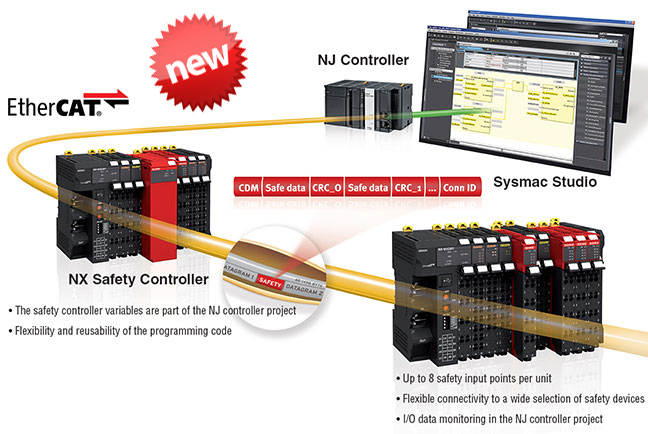 One example is our NX Series Safety Controller and Sysmac automation platform. This solution leverages one software platform on one network and in one control system resulting in integrated safety, logic, motion and vision disciplines. For more information on the NX Series Safety Controller and Sysmac automation platform, call Innovative-IDM at 877.906.2100 or send us an email at info@iidm.com. Hi I’m gene gray. Welcome to innovative IDMs intergalactic headquarters. Are you a manufacturing facility a plant with automated machinery, conveyors, and robots, all kinds of things spinning around and moving? Well you’ve got to keep it up and running. Sometimes that’s a stressful thing to do, and expensive, so let’s talk about a couple ways that buzz and I have been discussing that can potentially help you stretch your maintenance dollar, get the most out of that buck, help your budget go just a little bit further. Now it’s important that when you talk about stretching your maintenance budget that you think about your supply chain. It’s not just the cost of parts, anybody’s going to tell you that that’s important, sure that’s important, but it’s not the most important, but it’s not unimportant. Now I’ve been in this business since 1989 and I’ve found by visiting many different factories that they’re all different, they don’t have the same capabilities. Some of them have different styles of maintenance teams heavier in mechanical or electrical, some have engineering departments, and some don’t have any of that. So what do you do, how do you keep it up and running? Well one of the things you need to do is preventative maintenance programs and most of you probably know, do those right now, some of you have heard about it, when you have that pm program are you using hot spares? I mean you’ve got that spare sitting over there on the shelf when you bought it but the last time you had a controlled shut down did you install it, take out the other one you know was working fine, to make sure the spare actually works? To make sure that your maintenance people do have the skill set to practice putting that in, in a break down situation. If not, you might want to do that. When something that’s expensive breaks, you want to stretch your dollar, get it repaired, send it to Innovative IDM we have an in house electronic repair department. Now if you’re one of those plants that don’t have all the resources that you need, maybe you’ve got a controlled shut down coming up, and you have a big project and you need some field service staff. Well outsource it. Innovative has a 24/7 365 field service team. We can send you the extra boots you need to get on the ground to get that project done. Maybe the thing that’s broke down or the problem that your having is too complicated for the staff you have, or like we’ve talked about maybe that guys on vacation, well give us a call we’d be happy to help you out. Now you really want to get the most out of this dollar, you don’t want to call innovative just when you’re broke down, give us a shout so we can get out there, you can meet our field service team techs before that ever happens, we can get to know your machines, we can get to know your processes, that way if it’s in the middle of the night, production uptime is super important, we can be efficient as a team mate. Now putting together a company that’s got field service technicians, a repair center, things that we can help you with from an outsourcing perspective, to make sure that your supply chain is playing a part in stretching your budget, why would we go through the trouble to do something like that? Huh buzz why would we do that? Well buzz knows it’s simple it’s innovative, were home to the legendary customer experience. Hi, my name is Andy Lewis with Innovative IDM. A lot of the times when I’m out in the industrial sector, I find a lot of my customers have problems with transients aka surges, sags or swells. Generally, what occurs here is due to your utility company who provides a power factor correction. Now, this can be done in a variety of ways. Switching due to time, temperature or it could be fixed based upon certain times of the day or temperature once again. Whenever this occurs this actually sends a spike throughout your electrical circuit through your service entrance down to your intermediary bus duct and right into your machines. What does this cause? Parameter failure and or loss, plc reset and down time due to machines having to be restarted. This causes a lot of problems for production, lots of money, lots of time and headache. There’s a couple of ways you can fix it actually, at the service entrance you can actually use a mov and selenium stack transient suppression unit. What this does is, the mov’s will take on the instantaneous voltage spike but it can’t handle it for too long because they’re self sacrificing. What will happen then is there’s a handshake from the mov’s (metal oxide varistors) to the selenium stack which will handle the brute force of the transient. After that, you could actually have surge protection in a intermediary way at the bus duct which will include once again the mov’s and the selenium stack but once again, not in as large of a size. Finally, at point of use you could actually use mov’s to help protect the machine from anything that’s come down stream already. If you’d like more information on this please contact us athttp://InnovativeIDM.com and remember Innovative IDM is the home of the legendary customer experience.